Designed with an adhesive that provides good initial adhesion and holds well with minimum rub-down, Scotch® Filament Tape 897 is a general purpose solution for a variety of bundling and reinforcing applications. The backing, filaments and adhesive combine to provide high tensile and shear strength compared to general purpose tapes. It allows for printing and illustrations to be seen through the tape. This tape holds under a wide range of application conditions with a minimum amount of tape, leading to lower cost for applications where high tensile strength is a main requirement. 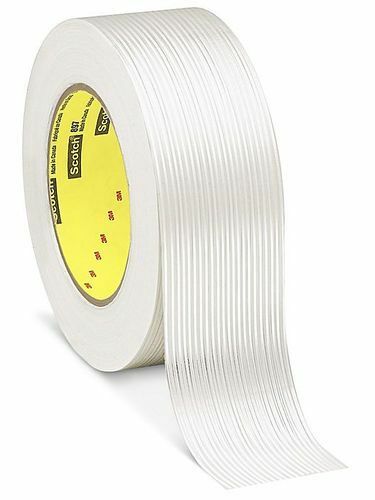 Our Scotch® Filament Tape 897 is a medium strength, general purpose, clear fiberglass-reinforced tape -with a synthetic rubber resin adhesive ideal for medium-duty strapping, bundling and reinforcing. Our synthetic rubber resin adhesive provides good adhesion to most surfaces, including a variety of plastics, carpets, natural fibers, and metals. Bapna Enterprises was established in 1993 as an Manufacturer, Supplier and Trader of adhesive tapes that has grown over the years to include many other product lines, markets, and industries. This steady growth over the years is a testimony to the quality of our products. We strive to provide the product mix of a large company while maintaining the personal service of a small company. As a privately owned company, Bapna Enterprises emphasis is on servicing our customers with the goal of fostering long term partnerships. We mainly deal directly with industries end users without any distributors & channel partners .Bapna adhesive tapes provide a controlled range of high tack, low tack, removable or permanent properties for splicing, temporary masking, bonding and assembly applications. Splicing tapes are widely used in the printing, processing, converting and coating industries, where quick stick and bond durability are critical to customers’ applications. Surface protection tapes provide temporary masking to prevent scratching and damage to critical components, such as mobile communication devices, computers, automobiles, glass and polished metals. Bonding tapes utilize high strength acrylic adhesives for permanent assemblies. Acrylic pressure sensitive adhesives are available in formats of adhesive transfer tapes and double coated tapes for close fitting bond lines or as double coated foam tapes and mounting tapes for gap filling applications.